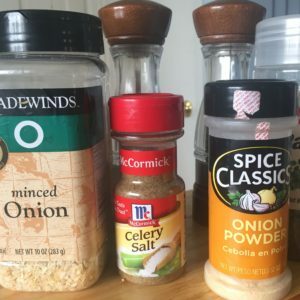 April 7, 2017 0 comments on "How to Make Onion Soup Mix"
This onion soup mix is really easy to make. I had put off making it because I don’t use onion soup mix much, but I recently made some homemade meatloaf, and the recipe called for onion soup mix. This mix would also make a great dressing for chips or a vegetable tray (I love this vegetable tray with lid). To make this recipe I used dehydrated onions that I had prepared early this year, but you can also use minced dried onions from the store. Mix all the ingredients together and store in a mason jar or other air tight container. These great food storage containers have chalkboard labels on the front to easily label them. If you use a mason jar and you have a Food Saver , you can use the vacuum jar sealer to seal your jar to keep your mix fresh between uses. Two tablespoons of this homemade mix equals one package of store bought onion soup mix (except without all the added colors and preservatives). One recipe makes about four “packages” of mix.